Despite the inarguably compelling dimension that helmet-cam video has added to my photography, I admit I'd begun to give up on it. I was tired of endlessly battling mount systems with my Contour 1080P cam, only to get home and discover that another two or three gigs of raw footage were useless because of color, exposure, alignment, or jiggle issues. Getting usable footage was like trying to win the lottery. It wasn't fun any more; it was just work—and a crapshoot at that. GoPro and Contour have been the two main players in the helmet cam universe from the start, and they've each taken distinctly different approaches. When I got my first helmet camera, I went with Contour because it was reportedly sharper, and because it was smaller and lighter. With the GoPro system, you start with a very light camera body—3.5 ounces, measured—but weight and bulk increase when you add GoPro's mandatory waterproof housing case and mount. So, for a minimum functional configuration, weight jumps to 7.1 ounces. With either camera, Contour or GoPro, the original models quickly became known for their significant exposure problems in bright light. For a great example of the limitations of 1st-generation helmet cams in bright sunshine, look at 1:27 of this video of Mammoth Mountain. As vexing as burnt highlights were, however, I found myself strugging even more with the Contour's tendency to add a magenta tint to everything. This can be corrected, to some extent, via software tools, but it is time-intensive and hardly optimal. And so, as I say, I was pretty much fed up with the whole business. Or so I thought until I heard that GoPro had released an update to the original HD Hero helmet cam. 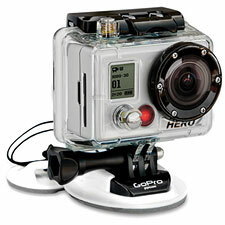 Called the Hero2, the new camera was said to specifically address the original model's sharpness and highlight issues. I'll admit, given my struggles with the Contour, I didn't have high expectations, but curiosity plus guarded hopefulness proved enough to motivate me to buy a Hero2 and give it a try. Does the Hero2 do a better job with bright snowy scenes? Absolutely. I can't tell you how relieved I felt when I first uploaded raw ski footage from a sunny week at Telluride. You could see detail in the snow! It is perhaps an indicator of how pitiful the Contour's performance truly is that such a simple thing as seeing snow cat grooves should bring my heart such joy. Surprisingly, however, I found some of the Hero2's other qualities even more compelling. I didn't expect to like GoPro's mounts, but I've actually come to see them as much superior to the Contour systems. A key benefit of the GoPro mounts is that you can always aim the camera where you want, rather than being confined to (at most) a few click positions. In practice this means you can easily fine tune the camera's alignment. Even without an LCD preview, it doesn't take too much testing to figure out where to point the camera so that your horizons are level and your shots are true (a huge contrast to the endlessly-problematic Contour mounts). And the GoPro doesn't require a helmet—get the versatile chest harness or headband mount and you can leave your helmet at home. Highlight detail, as I say, is good with the Hero2, but color rendering is better. Color accuracy, in fact, may be the single best aspect of the Hero2's picture. No, you can't lock the white balance, so unfortunately there is some drift, but even so, the Hero2's colors look great. Sharpness is good, and the Hero2 shoots a (switchable) 170° field of view, which really proves useful in minimizing unwanted camera motion in 1080 mode. Noise is visible in shadows even in bright light, and low-light performance is generally poor. Helmet cams remain bright-light tools, in my opinion. If low light performance is critical for your needs, you should probably look elsewhere. Unlike my Contour, The Hero2 unfortunately shows visible brightness jumps when the autoexposure control adjusts the levels (there is no manual control or exposure lock). This happens because exposure is being adjusted in steps, rather than as a smooth gradient. It's probably more visible to my eye than it will be to most viewers, but it is still an annoyance that a modern video camera shouldn't suffer from—especially not a pro-grade camera. On the subject of annoyances, I should probably also mention that the Hero2's sound is at least as bad as the Contour's. At least you don't have to tape over a mic hole to prevent wind noise clipping. Overall, the Hero2 has renewed my interest in helmet-cam videography, and this I think is what matters most. I found the Hero2 fun and easy to use, and I was consistently pleased rather than disappointed with my results. Are there quirks and issues to be found? Yes. Helmet cameras remain the troubled sibling in the camcorder family, oddly and often frustratingly maladjusted. The addition of manual controls would be significant (especially white balance and exposure), and GoPro at least hinted to me in correspondence that they are contemplating firmware updates to accomplish that. Be aware also that Contour has released a high-end update to their camera line, called the Contour Plus. Still, for me the choice is clear: for its natural colors, its highlight detail, and its versatile and effective mounts, the GoPro easily wins my recommendation.